Farley Water rises on Exe Plain at approximately 1400 feet above sea level. 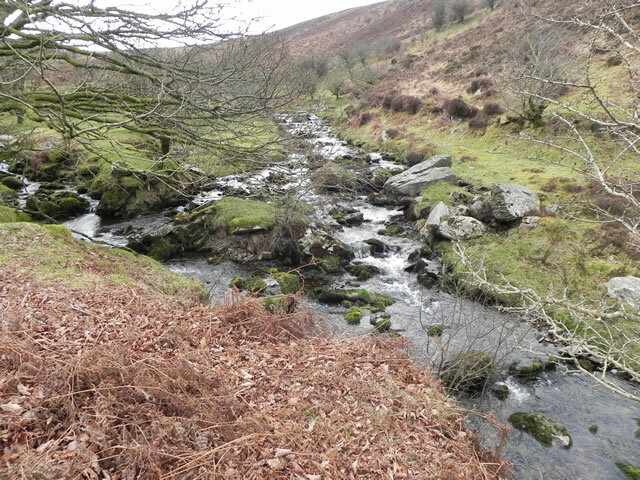 Flowing in a north easterly direction in the valley between Exe Plain and Hoar Tor it reaches the county boundary to flow into Devon. It then flows in a more northerly direction and is joined by tributary streams from Clannon Ball and then Holcombe Burrows. Flowing on past Pig Hill on its East side and Cheriton Ridge on its west side it reaches Middle Hill and Farley Hill, here it is joined by tributary streams that originate on the edges of Brendon common before flowing down between Pig Hill and Middle Hill, and Middle Hill and Farley Hill.It flows on through Lawn Wood and Longclose Wood to the west of Farley Water Farm, and then Sanctury Wood to the east of Cheriton to reach the small hamlet of Bridge Ball. From Bridge Ball it flows through South Close Wood and Lower North Ground Wood to reach Hillsford Bridge where it joins with Hoaroak Water.